Increase member sign ups & retention with our AVChat Integration Kit for Joomla! Our AVChat Integration Kit for Joomla! integrates with the 3 big Joomla! community scripts. We're offering a 20% discount code for new EasySocial licenses to all our AVChat Integration Kit for Joomla! clients. More than 250 websites have chosen AVChat + the AVChat Integration Kit for Joomla! to improve their Joomla! website. May 30th, 2014 by Simon E.
With the AVChat Integration Kit for Joomla! you can instantly increase member sign ups and retention. Who’s Chatting Module for Joomla! The Who’s Chatting Mod for Joomla! shows on every public and private page of your Joomla! website what chat rooms are open and who is in the chat. Visitors can log in using their existing Facebook and Twitter accounts and invite their Facebook and Twitter friends to join them. You can limit chat access - or some of the chat features - only to certain (premium) member levels, motivating visitors to sign up and regular members to upgrade. Add Google AdSense to the chat page and profile pages of your members and start earning real cash from your website. AVChat - or just some of it’s features - can be configured to be available only to members thus motivating guests to sign up or subscribe. Increase revenue with affiliate links in the chat. Keep your Joomla! members connected on the go with mobile rooms, mobile text chat and mobile users list. The login screen is the 1st screen a mobile member will see. With the Joomla! Integration Kit the username and gender options will already be filled with the members details. 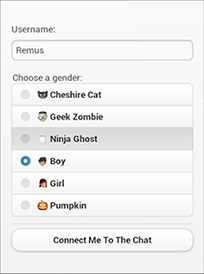 The users list shows you who is in chat, their gender avatar, whether or not they have webcams and if they're on a desktop or mobile device. The AVChat Integration Kit for Joomla! ($49) contains the AVChat Component, Who's Chatting Module and the Users # in Backend Module . AVChat 3 Integration Kit for Joomla! Members will have the same username in the website and in the video chat. Double login is not needed. The profile photos from JomSocial, Community Builder or EasySocial are automatically used for the users list and text chat inside the video chat. All the important chat options are available int the Joomla! backend where they're easy to access and configure. 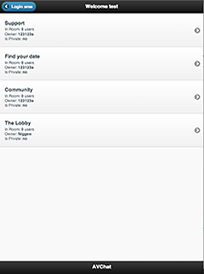 The widget can show on every page of your website what users are in the chat rooms. 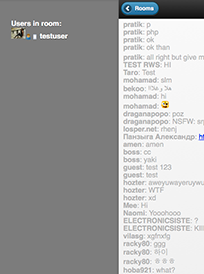 The widget can show on every page of your website what rooms are open in the chat and how many people are in them. We provide a free installation of both AVChat and it's Joomla! Integration Kit (on your Joomla! website) with every purchase. Email contact@avchat.net after purchase and ask for the free installation service. In addition everyone has access to our community forum where you can talk to our Joomla! and AVChat developers and request new features. The code for the Joomla! Integration Kit is licensed under GPL which means it's unencrypted and you can modify it and extend it to perfectly suit your needs. The AVChat Integration Kit for Joomla! is one of our best integrations. 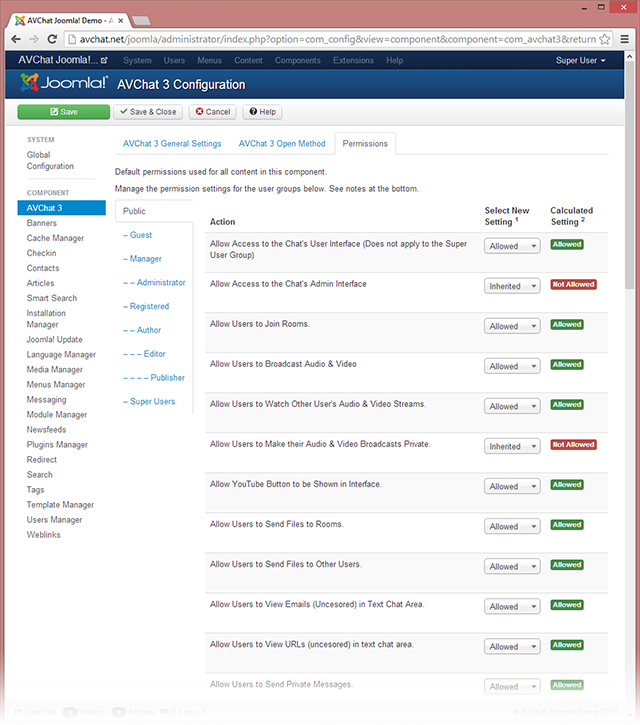 It has member level permissions, easy access to AVChat settings in the Joomla! backend, easy to add ads and a Who's Online Module that's easy to use. The download link and license will be delivered by email (takes a few seconds). The ideal package for new websites. The ideal package for small but growing websites with up to 4.000 members. The standard package, good for websites with up to 10.000 members. Yes, you can ask for a refund within 10 days of receiving the software. Yes, we provide a free installation with every purchase. Email contact@avchat.net after purchase and ask for the free installation service. Yes, you can upgrade your AVChat license at any time. When you do you only pay the price difference. The upgrade process involves changing the license key with 1 click.